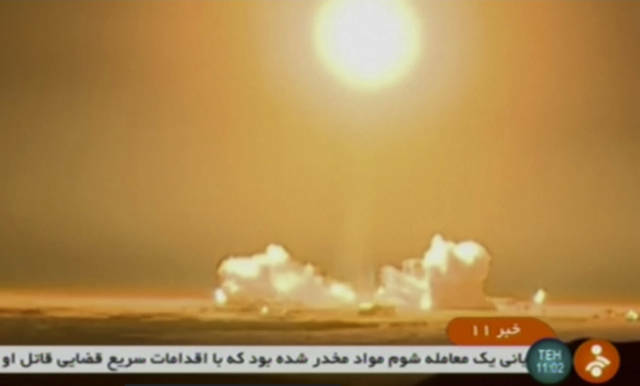 TEHRAN, Iran (AP) — An Iranian satellite-carrying rocket blasted off into space on Tuesday, but scientists failed to put the device into orbit in a launch previously criticized by the United States as helping the Islamic Republic further develop its ballistic missile program. Pompeo has said that Iran’s plans for sending satellites into orbit demonstrate the country’s defiance of a U.N. Security Council resolution that calls on Iran to undertake no activity related to ballistic missiles capable of delivering nuclear weapons. 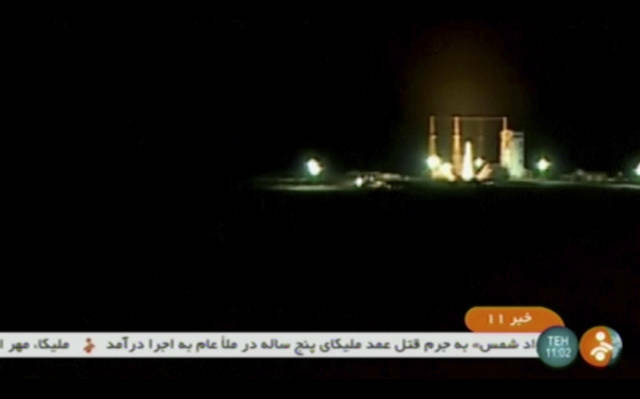 There was no immediate American reaction to the launch Tuesday. Disclosure statement: Caitlin Killian does not work for, consult, own shares in or receive funding from any company or organization that would benefit from this article, and has disclosed no relevant affiliations beyond their academic appointment. BEIJING (AP) — China expressed its “strong dissatisfaction” with Canadian Prime Minister Justin Trudeau on Tuesday over his criticism of a death sentence given to a Canadian accused of drug smuggling at a retrial that followed a chilling of relations over the arrest of a senior Chinese technology executive. Trudeau should “respect the rule of law, respect China’s judicial sovereignty, correct mistakes and stop making irresponsible remarks,” foreign ministry spokeswoman Hua Chunying said. “We express our strong dissatisfaction with this,” Hua told reporters at a daily briefing. Schellenberg was detained more than four years ago, went on trial in 2016 and was initially sentenced to 15 years in prison in November. The Chinese media began republicizing Schellenberg’s case after Meng’s detention. Within weeks, an appeals court suddenly reversed the earlier decision, saying the sentence was too lenient, and scheduled Monday’s retrial with just four days’ notice. The court gave no indication that the death penalty could be commuted, but observers said Schellenberg’s fate is likely to be drawn into diplomatic negotiations over China’s demand for Meng’s release. Schellenberg’s defense lawyer, Zhang Dongshuo, said his client plans to appeal the verdict. Zhang, a Beijing-based lawyer who has taken on several high-profile cases involving foreigners arrested in China, previously represented Phan “Sandy” Phan-Gillis, an American woman convicted of espionage and deported back to the U.S. in 2017. Questions have swirled over the court’s rapid retrial and sentencing of Schellenberg. Zhang said while the court’s actions were all lawful, they were also “abnormal.” Among the unusual features of the proceedings, according to Zhang: the public nature of Schellenberg’s December appeal, the swift scheduling of the retrial and the fact that the court announced its sentence just one hour after the trial ended Monday. Trudeau suggested on Monday that China was using its judicial system to pressure Canada over the arrest of Meng, who is also the daughter of Huawei’s founder. “All countries around the world” should be concerned that Beijing is acting arbitrarily with its justice system, Trudeau said. Hua dismissed such concerns, saying the 222 kilograms (489 pounds) of methamphetamine that Schellenberg was accused of smuggling merited the harsh penalty. “When facing such a serious drug smuggling crime, I think any responsible government that takes resolute measures to deal with the case just reflects the responsible attitude and strong determination of the government in protecting the lives and safety of its people,” Hua said. Describing the case as “highly politicized,” the human rights group Amnesty International urged that Schellenberg’s sentence be revoked. “The sudden retrial and apparent rush to judgment has highlighted the numerous flaws in China’s judicial system,” China researcher William Nee said in a statement. Since Meng’s detention, China has arrested two Canadians in apparent retaliation. Michael Kovrig, a former diplomat, and Michael Spavor, a businessman, were both arrested on vague national security allegations. A Canadian teacher was detained but released. Ren Zhengfei, Meng’s father and Huawei’s founder, told foreign reporters on Tuesday that he doesn’t believe the death sentence and arrests of the Canadians are related to Meng’s detention. “Personally, I don’t see a connection between these cases and Meng Wanzhou,” he said. SHENZHEN, China (AP) — The founder of Huawei said Tuesday his company would refuse to disclose secrets about its customers and their communication networks, trying to lay to rest concerns the Chinese tech giant might spy for the Communist government. Disclosure statement: Chris Stafford does not work for, consult, own shares in or receive funding from any company or organization that would benefit from this article, and has disclosed no relevant affiliations beyond their academic appointment. Partners: University of Nottingham provides funding as a founding partner of The Conversation UK. Having been controversially postponed in December, the parliamentary vote on the UK’s draft withdrawal agreement from the EU has been rescheduled for Tuesday January 15. The prime minister seems confident that she can get her deal through but, then, the same was true back in December before she hastily cancelled the scheduled vote precisely because she came to accept that the opposite was true. The deal is still the exact same one that MPs were sure to reject back in December. After months of telling people that it was the only deal on the table, the prime minister went to Brussels after the vote in parliament was put on hold to try and gain some concessions, only to be told that she had been right all along – it was indeed the only deal on the table. Having failed in their attempt to oust May in a no-confidence vote in December, hard Brexit plotters Boris Johnson, Jacob Rees-Mogg and company have had to readjust their plans. But they continue to heckle from the sidelines and are still unlikely to support May’s proposal. Johnson is championing a no-deal scenario, which makes sense given that is where his current manoeuvrings are likely to lead. Of course, there are others in the Conservative Party who have their eyes on the premiership and many key government figures are positioning themselves for the leadership now that they know that May will be standing down before the next election. Numerous government ministers have spoken out against a no-deal scenario such as Amber Rudd, Chris Grayling, Michael Gove and Sajid Javid to name but a few. This may be a sign that May’s deal, or some version of it, could make it through parliament eventually. Someone else looking to claim the title of prime minister is of course Jeremy Corbyn, who reportedly plans to call a vote of no confidence in the government immediately if May loses the vote. Although he has been regularly criticised for not having a clear stance on Brexit, the reality is that the Labour leader perhaps doesn’t need one, not just yet anyway. There will come a time when he will have to take a stance, but his current “wait and see” approach keeps his options open and allows the Conservative Party to keep tearing itself apart. The longer that continues the greater his chance of ousting them at the next election. If he instructs his MPs to vote down the deal, the consequences for Labour might not be too detrimental given that the public (in no small part thanks to the efforts of people like Johnson and Rees-Mogg) don’t like the deal anyway. The real issue may come after the vote and whether or not to support a second referendum. However, right now it is Labour’s Yvette Cooper, not Corbyn, who appears to be putting up a more effective opposition to the prime minister. Leading a cross-party group of MPs she successfully tabled an amendment to the Finance Bill which will make it much more difficult to levy taxes in the event of a no-deal Brexit. The defeat won’t stop the Brexit process and the government can always find other ways to raise funds, but it highlights the struggles faced by the prime minister given her lack of a working majority in parliament. It also sends a clear signal that parliament is willing, and perhaps able, to take back control of the Brexit process. That message was driven home once again when the group successfully tabled and amendment that means the prime minister will have to return to the house with a plan within three days if she loses the vote on January 15. It also suggests that a no-deal scenario is unpopular not just with key government figures but also with the majority of MPs in parliament and that the hardline Brexiteers are losing their influence on the discourse. This might be something the prime minister could use to help push through her deal, as given that the EU is unwilling to amend the deal itself, it really does appear to be her deal or no deal. If the prime minister can get some strong assurances on the more contentious issues, something which the Irish Taoiseach has suggested is possible, then the deal could make it through parliament, perhaps after a few attempts. If not, there will be Labour’s potentially more successful vote of no confidence to deal with. Failing that and in light of the EU’s insistence that negotiations will not be re-opened, perhaps the only other option is the highly divisive prospect of a second referendum. Andrew McDowell: Tabling an amendment whose entire purpose is to make one option less attractive suggests to me that Parliament is not acting as a means for finding the best answer to the question at hand. I would have hoped that Parliament was a relatively good example of collective decision making, as Members are professionals selected for this particular job. Are there rules for debate or for collective decision making which would make Parliament more efficient in the job of selecting a collective decision? Are the somewhere proofs that there is no possible advance over the current situation?